An ex-pat mom writes about life in the jungles of Venezuela, politics and much more! I just found this blog a couple of days ago and LOVE it! It is very informative about missionary life as well as entertaining - - a great variety. Thank you for the strong Christan witness. Delightful reading and sensitive to human rights violations like yesterday\'s in Venezuela. &amp;quot;Muchas Gracias&amp;quot; for spreading the word around the world, people as evil as Chavez should be stopped ASAP. I am pleased with such a great blog. I have been pleased at the political news, events, well placed opinions and facts, not to mention the humor that makes this blog true to life and God honoring. Things you never thought you would want to know about living in a hot ol\' jungle, surrounded by Indians, and having the time of your life; then sharing it generously with her friends.\r\nJMom has a kind spirit which causes readers to want to come back to read more.\r\nProving, that the wholesome, Christian lifestyle is one we all should strive for. Jungle Mom\'s blog is a daily &amp;quot;must read&amp;quot; for me due to her being my baby sister. I love her sense of humor and sharp mind. It seems I got all the looks and she got all the brains in the family! Just kidding of course. I\'ve heard about most of her jungle jollies, but I still enjoy reading them on her blog. Jungle Mom is outstanding! She runs a diverse blog, sometimes serious and sometimes funny, and sometimes both serious and funny at the same time. Blogs don\'t get any better! I like Ritas blog because there is a lot of variety. I can catch up on Chavez, the US elections, and get my fill of jungle stories.\r\n\r\nRita is opinionated and funny. I like that. Jujngle Mom is one insughtful lady. She is abreast of politics as well as world affairs.\r\n\r\nShe has gone to the mission field in our place, and will be returning soon.\r\n\r\nAll her life experience and wisdom pcakaged in her blog---just for us to read. \r\n\r\nACCOLADES!!! This blog is a great combination of harrowing adventure tales, troubling news of Venezuela, and a witness to the power and wonder of a life devoted to God\'s work.\r\n\r\nVery inspiring! 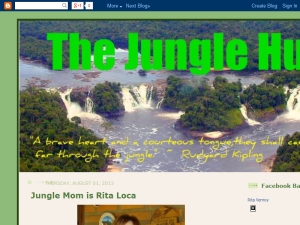 This what your The Jungle Hut Blog Ad will look like to visitors! Of course you will want to use keywords and ad targeting to get the most out of your ad campaign! So purchase an ad space today before there all gone! If you are the owner of The Jungle Hut, or someone who enjoys this blog why not upgrade it to a Featured Listing or Permanent Listing?